SodaStream says it was rejected from airing an ad during the Super Bowl that called out big soda companies, claiming that 500 million plastic bottles would be used during game time alone. Super Bowl commercials are known for being controversial. But what happens when one stirs things up among advertisers themselves? Apparently, they never get to hit the air. SodaStream (SODA) learned that the hard way. The home soda maker had prepared to air an ad during the NFL showdown that took on soft drink giants Coca-Cola (CCE) and Pepsi (PEP). 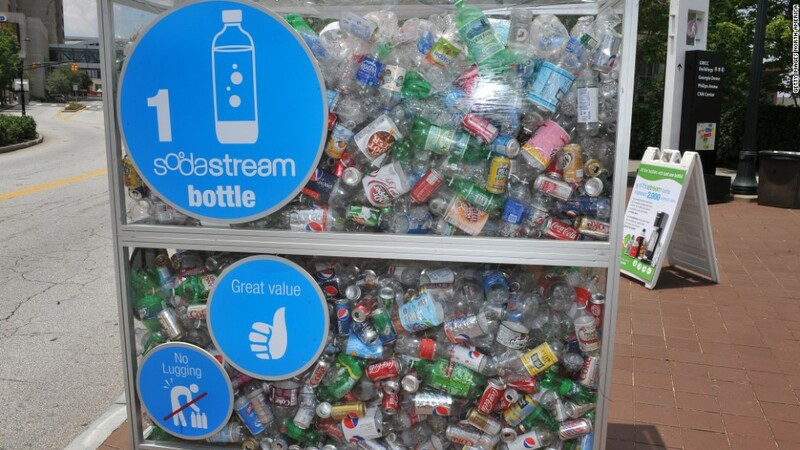 In the ad, SodaStream touts its reusable bottle by showing Pepsi and Coke deliverymen in such a rush to get into the supermarket that dozens of soda bottles pop and create a sticky mess. The ad then cuts to a man using a SodaStream, with a voice over saying, "With SodaStream, we could have saved 500 million bottles on game day alone." But the ad won't be aired. SodaStream claims television network CBS (CBS) rejected it for directly attacking two big beverage companies who are also its big advertisers. Pepsico is sponsoring this year's halftime show and has said it will air ads during commercial breaks, as has Coke. CBS did not respond to requests to comment on the story. Pepsi and Coke also did not return requests. "Our ad confronts the beverage industry and its arguably outdated business model," SodaStream's CEO Daniel Birnbaum said in a statement. "One day we will look back on plastic soda bottles the way we now view cigarettes." Birnbaum said plastic bottles cause untold damage to the environment, and the ad showed that there is a more eco-friendly alternative. Advertisers are paying big bucks for Super Bowl commercials this year. The price of a 30-second spot hit a record high of at least $4 million, blowing past last year's record of $3.5 million. Each year, many viewers tune in just to see the spots rather than the big game. Some ads create enough noise to be replayed and rehashed for days. In years past, other rejected ads from Bud Light to PETA, have turned their airtime loss into publicity by posting the would-be commercials online for millions to see. SodaStream doesn't want to miss out either. Though its commercial won't air on TV, the company posted it online under the headline, "Watch the SodaStream commercial they wouldn't let you see during the big game." The ad has gotten more than 2 million views on YouTube. "We understand that the...ad may be uncomfortable to the big soda companies, but we are proud of the ad and the truth that it brings to the American consumer," Ilan Nacasch, SodaStream's chief marketing officer, said.